Federal approval of cannabis sounds like a dream, but if GMO companies monopolize the market, we might end up with harmful bud in the future. The expanding cannabis industry is attracting new investors and companies looking to get in on the green rush. Unfortunately, it’s also attracting GMO producers, Monsanto and Bayer who are setting their sights on a genetically engineered cannabis industry. In 2016, Scott’s Miracle-Gro CEO, Jim Hagedorn expressed his desire to buy out the pot business and put up $500 million of his own cash to do just that. Monsanto and Bayer’s recent merger and growing interest in weed is of major concern for cannabis advocates. 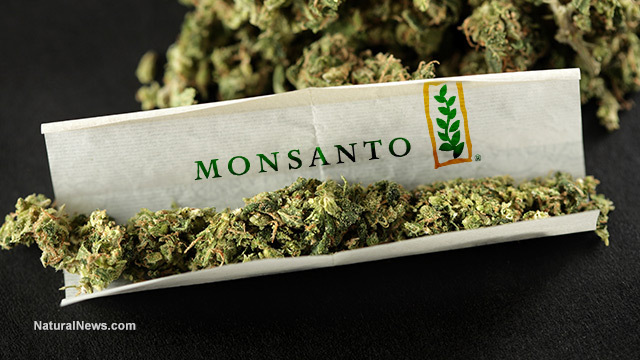 Last year, Monsanto patented the first genetically modified strain of cannabis. In addition, Scott’s Miracle-Gro (maker of pesticides and herbicides), whose CEO wishes to acquire the entire industry, is affiliated with Monsanto, while Bayer is connected to UK-based company GW Pharmaceuticals who sells Sativex, a cannabis spray that treats symptoms of MS.
A possible takeover of the marijuana industry by this monopoly means that genetically modified (or synthetic) marijuana could become the norm if corporations have their way. Monsanto’s recent move to “educate” European farmers on modernized agriculture (GMOs) is seen as an attempt to re-brand GMOs as a safe and inevitable path forward. Considering this, and the fact that Monsanto and Bayer are currently sharing trade secrets regarding the production of genetically modified marijuana, they seem to be setting the stage for a full-scale corporate colonization of cannabis. Billionaire George Soros who owns 630,000 shares of Monsanto has put up millions domestically and internationally in an effort to legalize cannabis. But the potential motives of such investments could mean that trouble is on the horizon for the industry. James Adamson, president of Medical Marijuana Technologies says that the much of the push for cannabis to become legal may be heavily influenced by the impending monopoly. There is presently no way to control the production of marijuana and the quality of the strains. A genetically modified strain produced by a company with the credentials and prestige of Monsanto would definitely lend a massive hand to pro-legalization activists within certain spheres of government and within the business world. As it stands now, marijuana’s federally illegal status may be the only thing that stands between Monsanto, Bayer and the billion-dollar, U.S. cannabis industry. Their pursuits remain limited to the 29 states that have either legalized or decriminalized marijuana. However, Drug Policy Alliance law specialist, Edmund Groensch believes that a huge push by corporate players might be the only way that marijuana can become federally legal. Currently, Federal law criminalizes marijuana and hemp derivatives because public opinion is still against it. A major player as Monsanto could bring confidence within government and towards investors in the market if it were to own a large part of the exploitable lands and commercial products. Federal approval of cannabis sounds like a dream, but if companies like Monsanto and Bayer monopolize the market, we might end up with less effective and potentially harmful genetically modified bud in the future.